Summer in the old South. Hot and sticky no doubt, the same as today. But simpler. Slower. Time for splashing in a river to cool off. Time spent planting and harvesting your own fruits and vegetables. No distractions found in a mobile device or television, but rather the pages of a book. Fresh air and chasing fireflies as the humidity floated off in the evening. When Lauren Emerson and I put together this shoot, we focused on those very things. All of the activities that modern life rarely affords for most. We were inspired by days gone by in the South, and the simpler lifestyle that used to exist. A time when summer afternoons called for wading in cool creek waters to escape the southern heat. One could be found sinking slowly into a hand crafted easy chair to read after dinner. Harvesting vegetables from the garden straight to the kitchen for a meal on the lawn as evening settles in. A gently rolling creek tucked into lush green trees served as the perfect backdrop to begin the shoot. Toes were dipped into the refreshing water, evoking emotion only the simplicity of nature can provide. As the sun fell just barely above the trees, dinner was served in front of a historic brick home that sits proudly atop an expanse of green. Southern charm in its simplest form, exactly what Tennessee does best. Lauren chose to use elements including vines and soft lavender roses in her floral design to complement the rich warmth of the brick along with the deep green of surrounding trees. A touch of modern came in with geometric glassware from The 12th Table, contrasted by heavy slate chargers and steel hued linens. Fresh vegetables grown locally by Bloomsbury Farm were sourced at the Franklin Farmers market just down the road. These foods dressed the table, while providing color and texture that married the surroundings and concept. 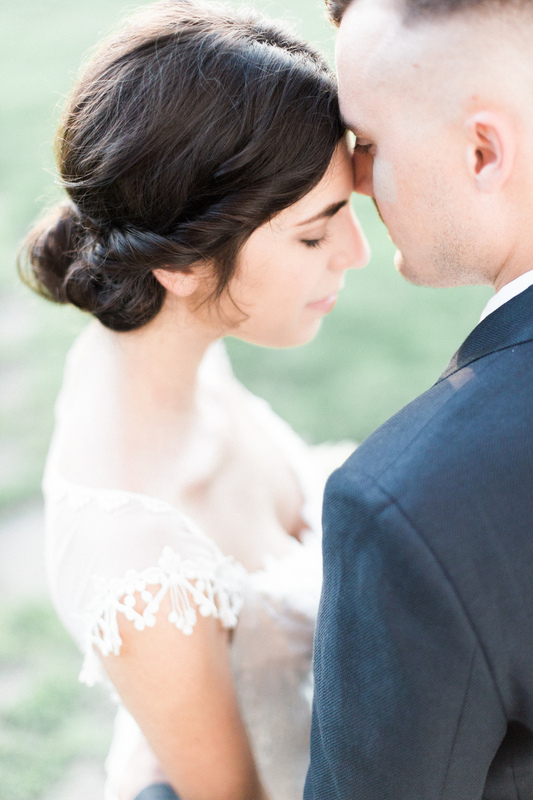 I am so excited to finally share the images from this shoot, also on Magnolia Rouge today!